These Guilt Free Pumpkin Pie Bars are just like your classic Pumpkin Pie — it’s silky smooth and creamy, perfectly sweet, and ultimately satisfying — but instead of a wedge of pie, it’s pie in a perfect square form! You’d never know these square pie bars are lower calorie, lower fat, and lower sugar than its circle counterpart. Like Pumpkin Slab Bars, these Pumpkin Pie Bars are made with a crescent roll dough crust. This was my first time ever trying crescent roll dough as a pie base, and I’m so glad I tried it out. Have you ever used crescent dough as a pie crust? It works so well! I liked how the crescent roll base provided a nice contrast in texture to the creamy pie filling. 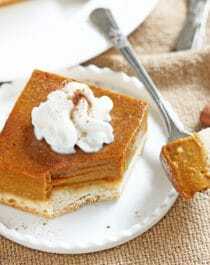 It also has just the right amount of flavor so that it complements the pumpkin pie filling rather than take away from it, which can happen sometimes with a graham cracker crust or gingerbread cookie crust. Unlike pies with a graham cracker or gingerbread cookie crust, the crescent roll dough puts the full focus on the flavor of the pumpkin pie filling. With every delicious bite you get a soft and buttery, lightly sweet crust with a silky, creamy, sweet and spicy pie filling. Made with an entire can of 100% pure pumpkin puree (so you don’t have to refrigerate any leftovers! ), sucanat (an unrefined sugar) for a comforting brown sugar flavor, and a blend of spices that we all love — cinnamon, ginger, and nutmeg! These Guilt Free Pumpkin Pie Bars are just as smooth, creamy, and sweet as a wedge of pie, it's just in square form! You’d never know these are lower calorie, lower fat, and lower sugar than typical Pumpkin Pie too! Preheat your oven to 350 degrees. Spray a 9x9" brownie pan with cooking spray and line with parchment paper. Unroll the crescent roll dough and press it into the pan. It's okay if it overlaps, just make sure to press it all down to create an even layer. Bake for ~19 minutes, or until surface is dry and just slightly golden brown. While this bakes, make the filling. In a large bowl, add the pumpkin, almond milk, and eggs. Whisk until completely smooth. Whisk in the sucanat, cinnamon, ginger, nutmeg, and salt. When this is completely smooth, pour this over the baked crust. Carefully transfer the pan into the oven and bake for ~50 minutes, or until it's almost completely set (the center will be a tiny bit jiggly but it'll continue to set as it cools). Let cool completely, then wrap with plastic wrap and refrigerate overnight. Run a knife or offset spatula around the edges of the pan. Slice into 9 bars. Serve with natural whipped cream and a sprinkle of cinnamon or pumpkin pie spice. Cover and refrigerate to store. Keeps for ~1 week. Adapted from the Pumpkin Pie recipe in the Naughty or Nice Cookbook. Did you know a slice of classic Pumpkin Pie can have around 300-450 calories, 14g-18g of fat, and a whopping 30g-45g of sugar?? Not here at Desserts With Benefits! These Guilt Free Pumpkin Pie Bars are perfectly sweet and spicy, but for only 190 calories, 5g of fat, and 18g of natural, unrefined sugar too. I would have never thought to use crescent rolls as a crust! Great idea! Any way to do this egg free? A vegan pumpkin pie recipe is definitely on my list of things to do!! Is the nutrition info for 9 bars or for 16? The top of the recipe says 9 bars but the instructions say cut into 16 bars. The nutrition info is for 9 bars. If you sliced into 16, each bar would have 105 calories! WARNING!!! These are HIGHLY addictive! I can’t stay out of them!! I used a different crust that I thought might be healthier, but other than that, I kid you not, there is NO WAY to tell that these are healthy!! Thanks Jessica, for the amazing recipe!